The IMCO Ton-Limit Detector and Hi-Low Limit Detector are sophisticated, state of the art, precision instruments built with a modular format featuring large, bright digital displays. They combine visual measurement of load at all times plus feature the unique Control Monitoring Knobs which lets the user pre-select, by a single dial, load trip points. 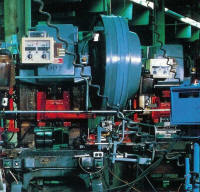 An IMCO system for your press is determined by the type of press not the tonnage of the press. Very simple in operation, the digital displays continually indicate load in direct tons always reading the actual tonnage at each working stroke. If any piezoelectric transducer signal exceeds the pre-set value it will activate the circuitry in milliseconds for press drive disengagement. An alarm or flashing light can also be used. 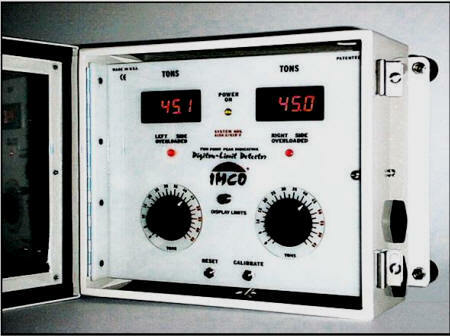 IMCO'S innovative and unique Digital Systems can provide limits in both percent and direct tons. The Control Knobs are used to set the limits. By pressing a center button "Display Tons", it displays each tonnage increment on the Digital Displays allowing the limits to be set with more precision. It is also possible to not only monitor for overload of the machines maximum capacity, but also the optimum tooling capacity which may be a great deal less than that of the machine. Following the correction of an overload or under load of an IMCO system, a reset button is located behind the clear lexan box cover to cancel out the readings and reactivate the system. Quality built for permanent shock mounting and designed for heavy duty use in an industrial environment, each system requires either 120/220 volts A.C., 50-60Hz. Contains solid state circuitry, fungus proofed and enclosed in heavy gages steel boxes with sizes ranging from 12"(305mm)x10"(255mm)x5"(130mm) to 4"(355mm) x12"(305mm)x 6"(155mm), each conforming to JIC standards. Operator has full visual access to all control functions through a clear-view lexan panel in the hinged door, that is key locked for supervisory control. Each system is supplied complete with piezoelectric transducers, mounting brackets, flexible two conductor shielded Belfoil cable for column mounting or flexible two conductor shielded Teflon cable for pitman mounting, which is impenetrable to oil and grease, shock mounts and an Installation Manual. Assurance for a better end product, worry free operations of presses through fewer breakdowns, fewer scrap parts, longer die life and safely loaded machines - an IMCO system can save a machine today for a more productive tomorrow. IMCO'S linear Ton-Limit Detectors show the operator or production personnel visually what load changes are occurring in the dies or press. When a load is applied to the press structure, such as the columns or pitman's of a press, the structure becomes either longer as in tension or shorter in compression. Mounting IMCO'S piezoelectric transducers to the column or the pitman's (customer preference) of the press, will detect structural deflection. Then by transmitting this low-noise signal from each piezoelectric transducer to an IMCO Ton-Limit Detector, it is possible to monitor each signal very accurately at each working stroke. 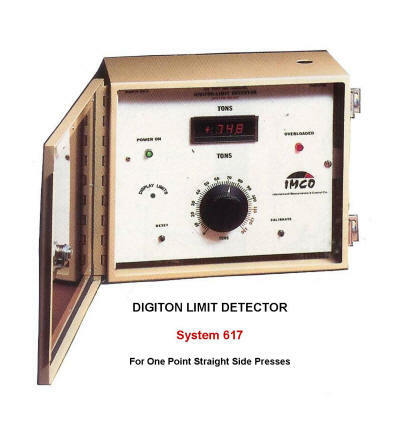 IMCO'S Digital Ton-Limit Detectors offer the user a more precise accuracy of readout in direct tons. 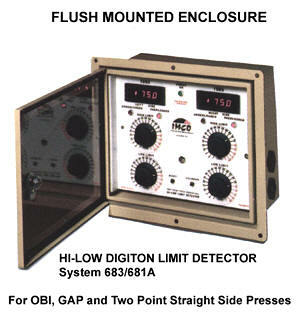 These Digital systems displays contains an exclusive Digi-Latch feature. When a signal for overload is given the display will indefinitely "lock in" the display amount indicating the peak load applied at time of overload. Reactivation of the system can only occur if the system is reset. 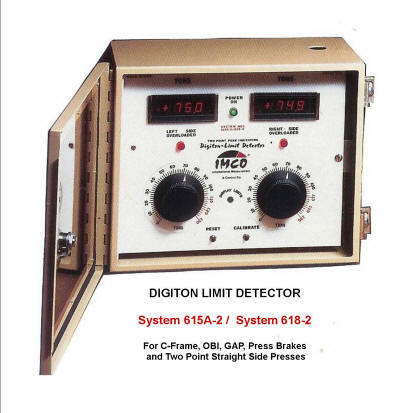 IMCO'S Ton-Limit Detectors also include one or more Monitor Control Knobs, depending on the type of press. 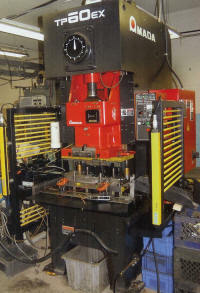 These knobs enable the user to pre-select maximum load to be applied to his dies, regardless of machine capacity. If the selected load trip points are exceeded the system will automatically signal for drive disengagement, and greatly reduce the possibility of a damaging overload to both dies and press. Monitor Control Knobs read out in Direct Tons or Percent Rated Capacity depending on the type of system ordered. 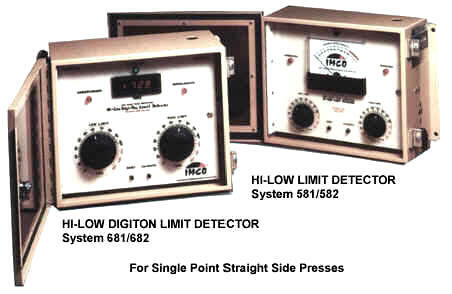 IMCO'S Hi-Low Limit Detector has the same featured working capabilities as the Ton-Limit Detector but has the advantage of monitoring for under loads as well as overloads. Ideally suited for automatic press line operations and where similar production requirements generate the importance of maintaining suitable under and overloads on dies. The user first observes the load being applied to press dies, while at the same time relates the load to the analog or digital displays. Then individually selects the high and low trip points on the designated Monitor Control Knobs. If then, the actual load varies more than the Monitor Control Knobs are set for, either by under load or overload, the system will automatically signal for drive disengagement. 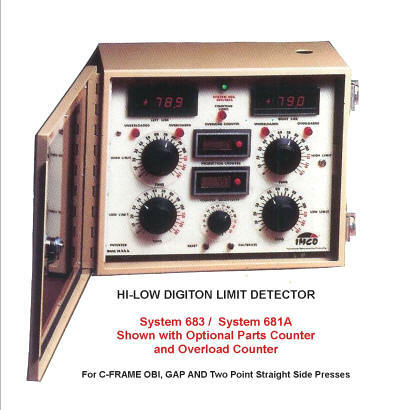 A cam or proximity switch is required for Hi-Low Limit Detectors to facilitate timing function of the low limit. 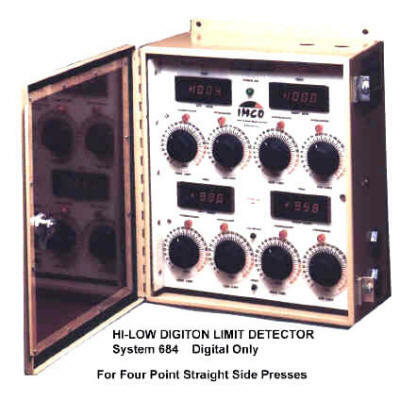 Digital Systems can provide Limits in both tons and percent - Press a center button "display limits" and it shows the limits on the Digital Displays in tons. It displays each tonnage increment on the Digital Displays as you turn the Control Knob which is in percent. 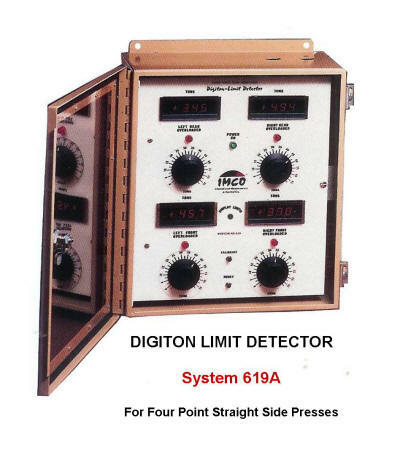 All digital systems will latch and hold display readings at time of overload or underload. It will hold indefinitely until reset. Standard. Cam/ Proximity Switch Assembly - A Cam or Proximity Switch is needed to activate the Low limit function of Hi-Low Limit systems. Option. will interface with your equipment and transmit the information. Option. Two Conductor Cable - Can be cut and spliced without ever having to rebalance system. Few wires to worry about. Standard. Shock Mounted - System and transducers are built to withstand excessive shock or vibrations. All system come equipped with four shock mounts. Standard. immunity giving clear load signals. Standard. Total Tonnage - Digital summing of the total press tonnage. Option. preset limit is reached. Option. disbursement of press load - No Switch To Flip. Standard. decreases stress load below pre-set limit and counter will not count. a valuable aid for Production Control by giving a total parts actually made.